Since its inception Branston History Group has completed a number of projects as set out below. 4. Publication of two books " Branston Remembered " and " Traditional Farmsteads and Farming at Branston "
Mosaic - Church Hall Car Park. 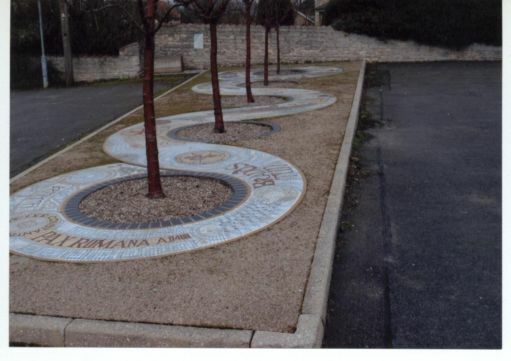 During the setting out of the Heritage Trail, Branston History Group undertook to create a mosaic time line highlighting details of the origins and the historical events relating to Branston, and to set it out in the church hall car park. The design was drawn up by artist Alan Potter and this was followed by a group members and volunteers working as 'nibblers & fixers' to shape tile pieces of the required colour and size and then fixing them in place. This work took two years to complete, being finished in 2007, and is now recognised as a special feature of the village. 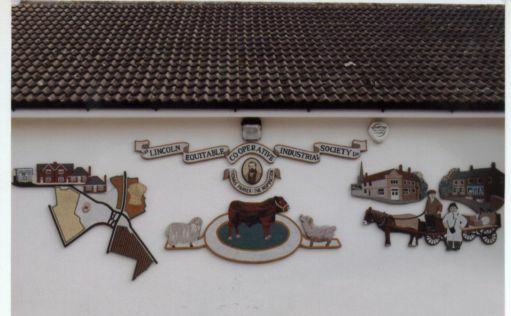 This mosaic was created by members of Branston History Group and volunteers who wished to mark the centenary of the Lincolnshire Co-operative's involvement in the life of the village. Throughout, the group has received support and guidance from ArtsNK, including excellent photographic work from Jane Harrison of ArtsNK.